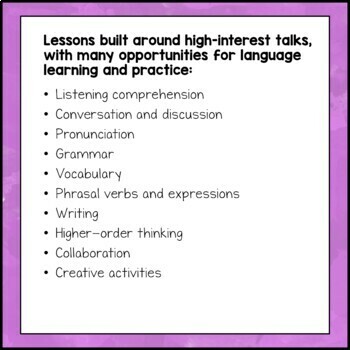 ESL Lesson: Based on a TED talk by Tania Luna and is designed for upper intermediate and above ESL learners to practice listening, speaking, reading, writing, vocabulary and grammar skills. Discussion questions encourage higher order thinking. Perfect for a Thanksgiving theme! Complete lesson notes and answer keys as well as ideas for expansion activities included. This lesson is ideal for use in the flipped classroom. The video can be assigned for homework and discussion questions can be done in pairs or small groups during class. Lesson activities can be either be done in groups or at home and discussed during the next class. 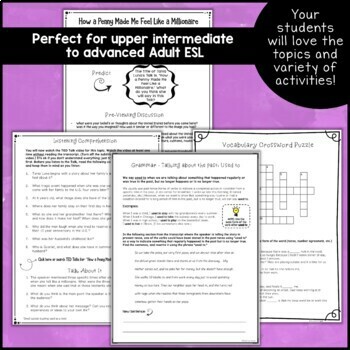 These activities are for upper intermediate or advanced learners, but there are different levels of activities in this packet and you can choose those most appropriate for your level. There is a more challenging activity that can be incorporated for higher level classes or can be given to more advanced students in a multi-level classroom. ✿ Mini grammar lesson and practice activities related to talking about the past. This section discusses the use of present tense when telling a story, and practice with using the simple past tense. Additional optional activitities with the use of "used to" and "would" to talk about the past. 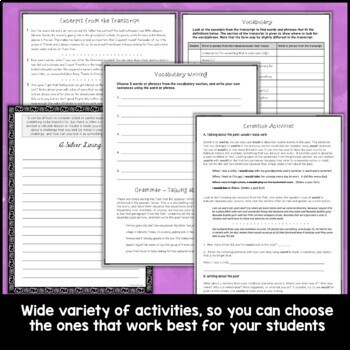 ✿ Writing topics related to the Talk topic. ➤Or better yet, purchase the bundle and save!